Appendicularians (also known as larvaceans) are unique animals that resemble tadpoles in shape. Unlike tadpoles, however, they do not metamorphose into a different form, but spend their entire lives as part of the zooplankton. Many marine animals use mucus for various purposes, but for appendicularians, mucus is necessary for them to feed and survive. They use mucus to build an intricate “house” that has a tunnel through the middle. The appendicularian beats its strong tail to create a current through the house, and the house collects the food particles in the water. It really is a special thing to be able to see an appendicularian inside of its house because most collection techniques destroy these houses. Even when someone does have access to an intact appendicularian house, it can be extremely difficult to view under a microscope, as documented here. Appendicularians create a feeding current to filter food particles from the surrounding water. The dotted arrows indicate the direction of the current through the house. If the housed appendicularian encounters waters that have food concentrations that are too high, the filter will clog, and the appendicularian must abandon its house. In order to keep feeding, it has to start from scratch and build a new house. Most appendicularians are thought to abandon and build several houses per day. For this reason, you see appendicularians in the ISIIS images that look as if they have no house (likely in the process of building a new one) or have fully formed mucous houses. Oftentimes you will see abandoned houses that appear slightly degraded, drifting slowly through the water column. Scientists think that these abandoned houses, which stick to all sorts of different particles causing them to increase in size and sinking speed, make up a large portion of organic material sinking through the water column (known as “marine snow”). This appendicularian has a house that appears to be accumulating many particles on the outside. It will likely abandon this one soon and start building a new house. 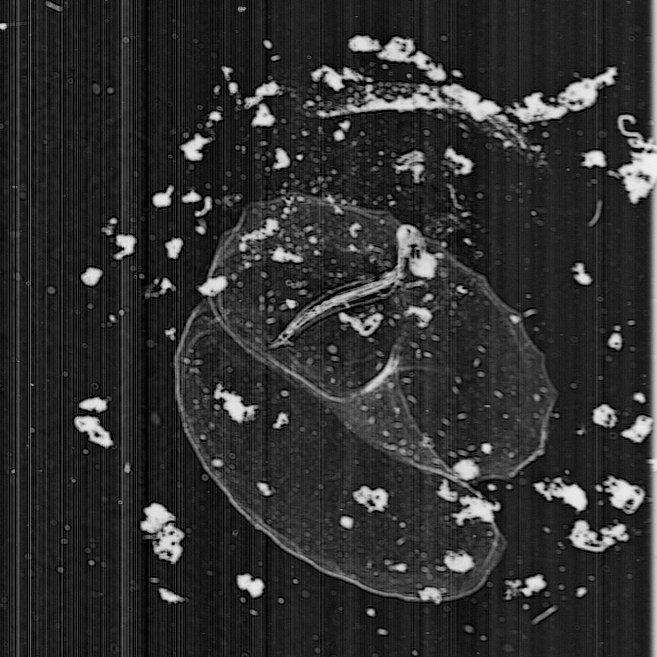 The faded mucous material below this copepod is what remains of an appendicularian house. 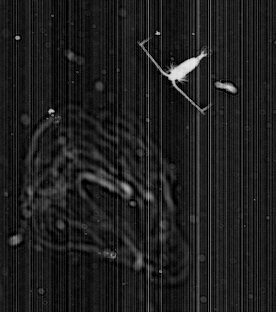 Other zooplankton might scavenge the food particles that collect on abandoned mucous houses as they sink into the deep ocean. Not only are appendicularians responsible for creating marine snow that exports carbon to deeper waters, but they are also important food sources for the early life stages of some commercially important fishes. In fact, research in the Cowen Lab demonstrated that many tropical tunas (little tunny, yellowfin tuna, skipjack tuna, etc.) feed almost exclusively on appendicularians as larvae, before beginning to consume other larval fishes once they reach a certain size (Llopiz et al. 2010). Many people also also surprised to learn that humans and appendicularians are classified under the same phylum (Chordata). This means that a few hundred million years ago, there was an animal living in the ocean that became the first organism to have a notochord as part of its developmental process. This ancestor gave rise to the fishes, which proliferated during the Devonian, and later all other animals that have backbones. Humans, modern reptiles, and appendicularians are all different end points on the tree of life that emerged from this common ancestor. Llopiz, J.K., Richardson, D.E., Shiroza, A., Smith, S.L., Cowen, R.K.,2010. Distinctions in the diets and distributions of larval tunas and the important role of appendicularians. Limnol. Oceanogr. 55, 983-996.